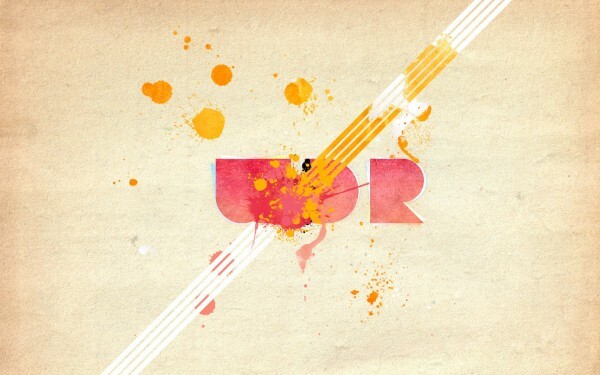 Typography and logo design are the trends now and I’m a huge fan of all this stuff. I have a great opportunity to share with you my experience and show you how to create an amazing watercolor logo in Photoshop. Grab some ideas for your poster, canvas and brochure printing projects. 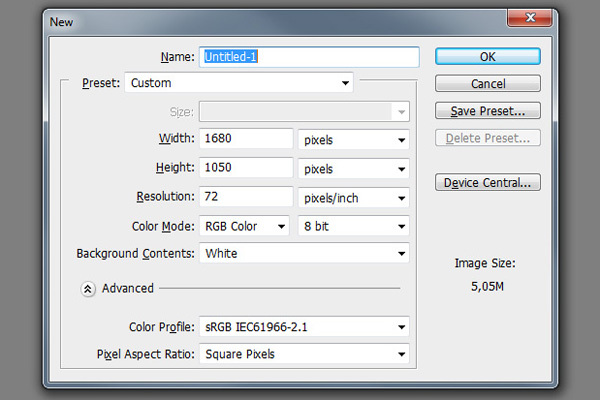 Open Photoshop and create a new document with dimensions 1680×1050 pixels. Use White color as the background. 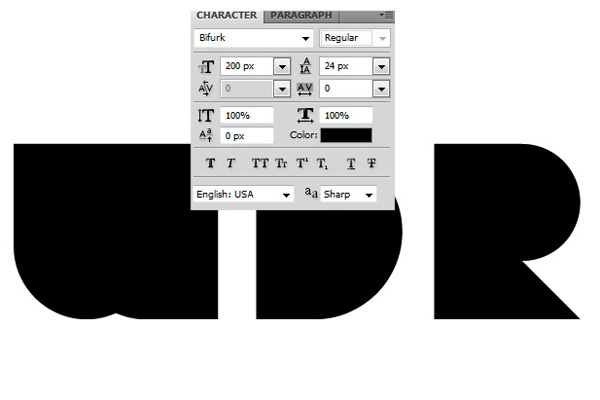 Write the text using the Text Tool (Horizontal Type) on a new layer. You need to write every letter of the logo on a separate layer. 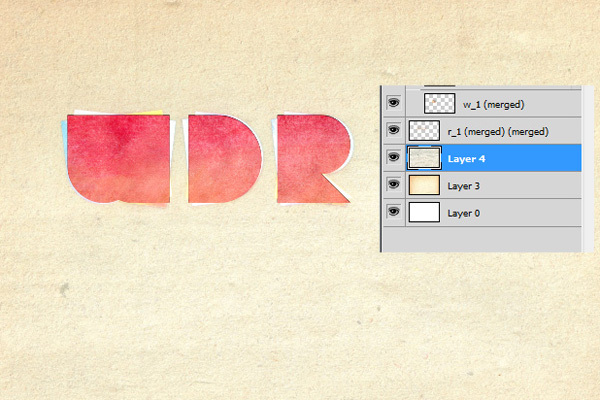 It took me three layers for the letters W, D and R.
Next, create a separate folder for each letter, I got three folders. We need to rasterize the text layers, right click on the layer with the letter, the drop-down menu will be open, select the Rasterize type. Repeat these steps for all the text layers. I’ll explain how to make an unusual effect on the letter W, then it’ll be necessary to apply this setting to other letters. Duplicate the layer with the letter «W» twice. Use the Free Transform Tool (Free Transform) or the keyboard shortcut Ctrl + T.
Rotate these duplicated layers – 6.5, the other at – 6.5. Rename them in the “w_1”, “d_1” and “r_1”. 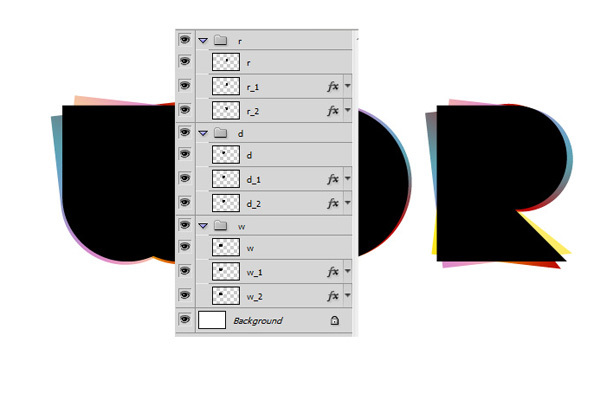 Add Style Gradient Overlay to the layers ““w_1”, “d_1” and “r_1”, as at the settings below. You can choose other colors, it’s up to you. Reduce the Opacity of these layers up to 50%. Repeat these steps for the other letters. 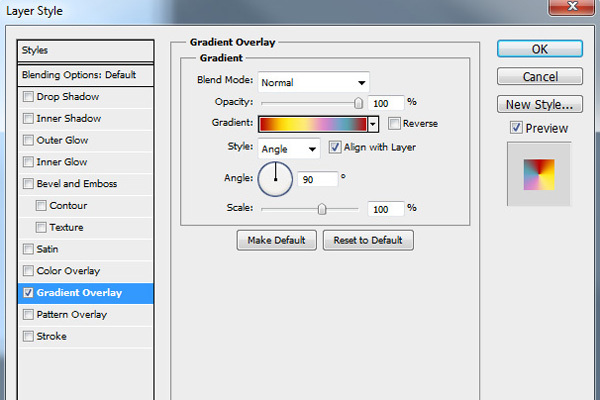 Select the two layers with a gradient, and press the key combination Ctrl + Alt + E, to obtain the merged layer. Place appeared merged layer below the layer with the gradient. 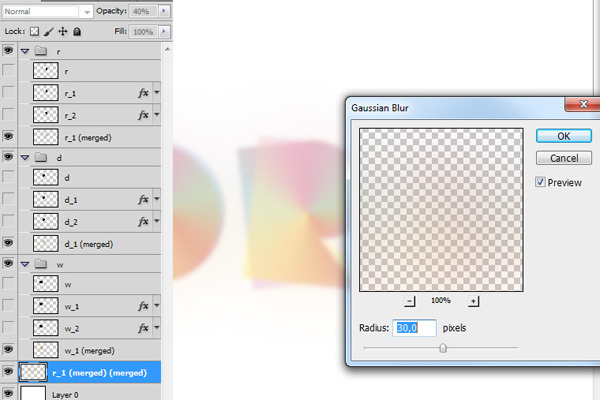 Apply to this layer Filter – Blur – Gaussian Blur 3 pixels. 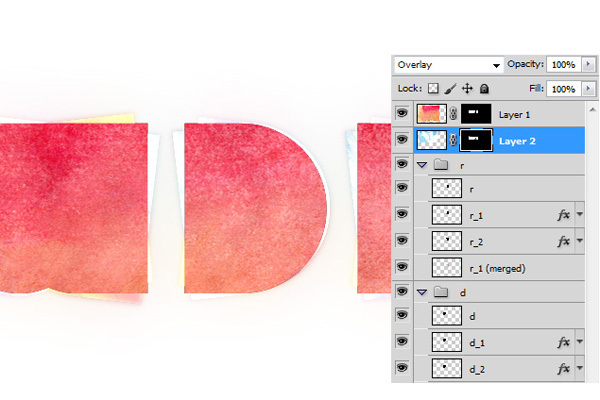 Hide the layers with black letters, by clicking the eye icon next to the bed. 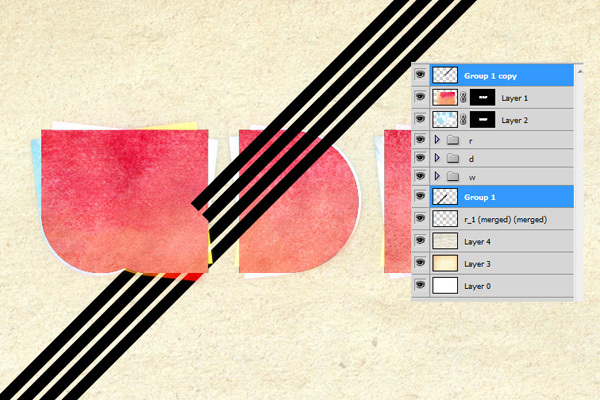 Select all the layers except the black letters, press Ctrl + Atl + E, to create a new merged layer. 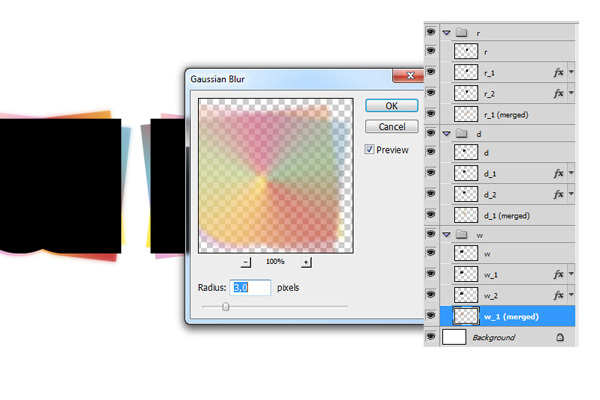 Move this layer below all the layers, apply a filter Filter – Blur – Gaussian Blur 30 pixels. Change this layer Opacity to 40%. 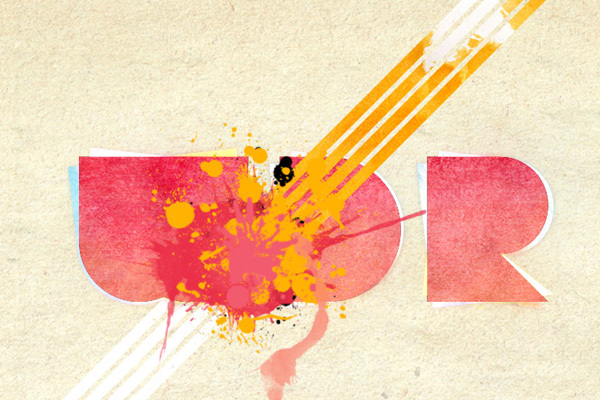 Open the downloaded watercolor red-orange texture in Photoshop, drag it into your document, transform to the needed size, place on top of the logo as in the screenshot. Holding on Ctrl and click on the layer with the black letter W, then select and hold down the Ctrl + Shift keys and click on the layer with the black letter D, you’ll get a selection of two characters at once. Repeat it with letter “R”. 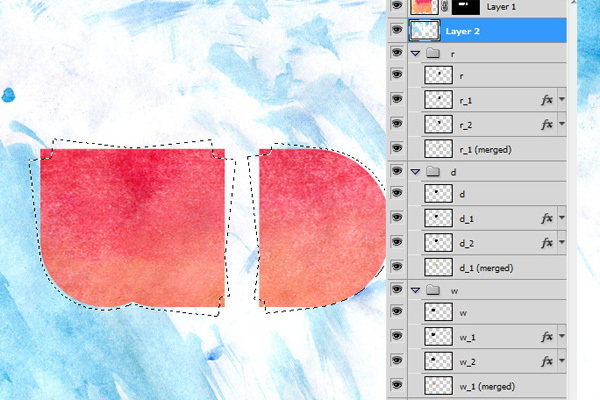 Then go to the layer with the watercolor texture and create a mask layer: Layer – Layer Mask – Display the selected area. Reduce this layer Opacity to 80%. 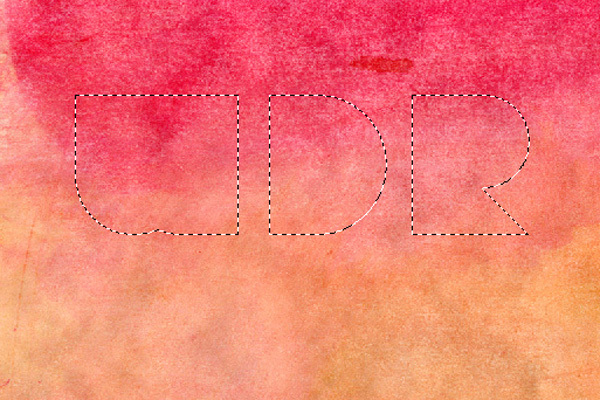 Drag the second watercolor texture into the document. Create a selection of layers “w_1”, “r_1”, “r_1”, according to the principle described above, repeat all the steps. Change the texture layer blending mode to Overlay. First, choose your favorite texture of old paper from the archives, I use paper2. Open and drag the texture of old paper into the document. Turn and transform it to a desired size Edit – Transform – Rotate 90 Clockwise. Move this layer below all the layers. Open the texture of the second archive, rotate it and reduce the dimensions of the document. 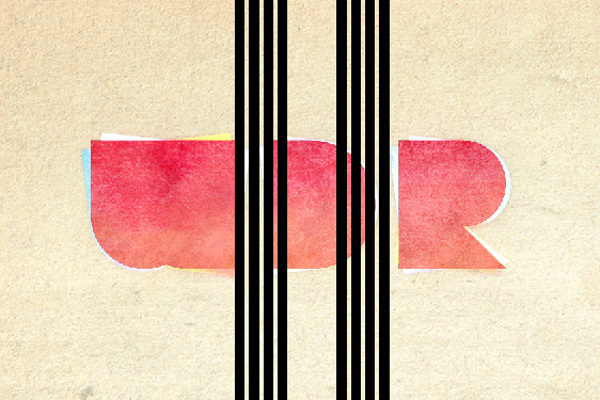 Move this layer below the layer with the letters, but higher than the layer with the texture of old paper. 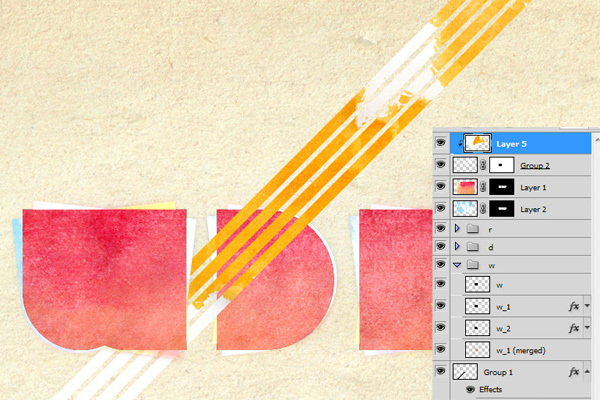 Create a new layer, using the Rectangle Tool, and then draw a thin line. Duplicate this layer three times, each time you copy a line of little displace to the right. Thus, we get 4 lines. Combine these four layers into one. 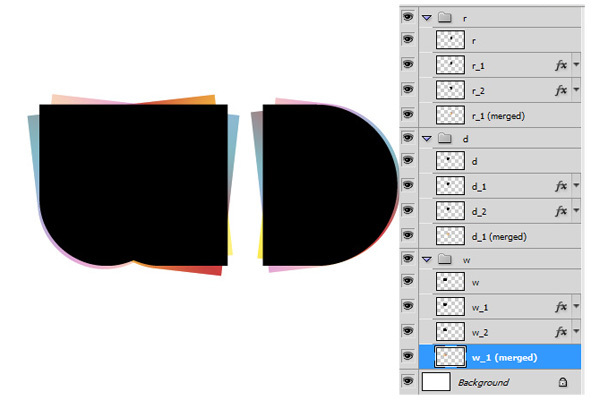 Duplicate the merged layer; place it as shown in the picture. Select the two layers with lines and transform them through the Free Transform Tool or use the keyboard shortcut Ctrl + T, rotate them and move one layer with lines down as shown in the picture, like we connect them with each other. 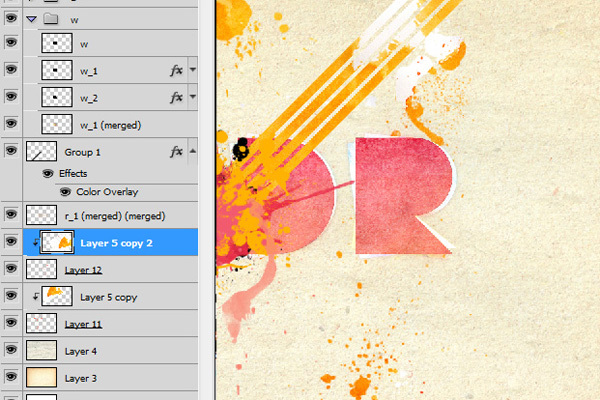 Open it in Photoshop, drag in your document, change to the needed size. Place it on top of the layer with the upper part of the lines, right click on the layer with the texture, select Create Clipping Mask. 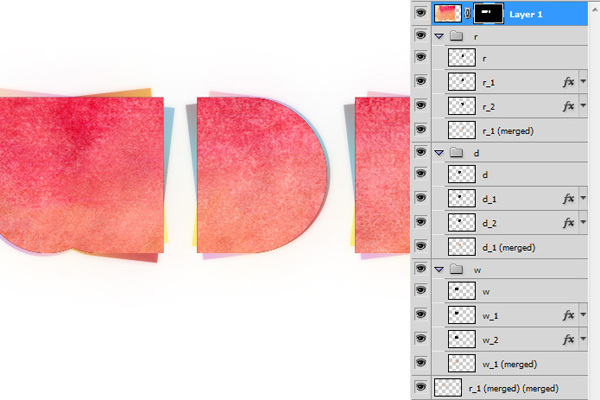 Create a new layer, create a folder above the layer with the background textures, move there this layer. Use the Brush Tool in order to paint spray. Now we need to create a copy layer of watercolor paint, which we used as a clipping mask to the layer with lines. 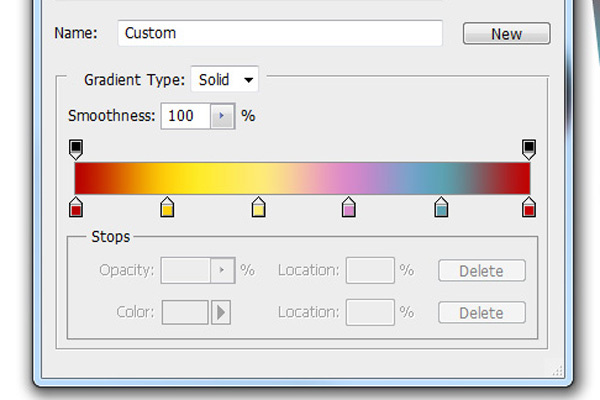 We use the key combination Ctrl + J, to copy the layer with watercolor paint. It’s what I get at the end. Hope you like the tutorial. If you have any questions, don’t hesitate to ask me in the comments below. Enjoy and Share with us how it works!